Eucalyptus Hardwood is a dense, straight-grain wood with a smooth finish. The color is a beautiful honey hue with a subtle rose sheen. This particular type of Eucalyptus, “Eucalyptus Grandis” is grown in 100 % well managed forests in Brazil and is certified by the Forest Stewardship Council. 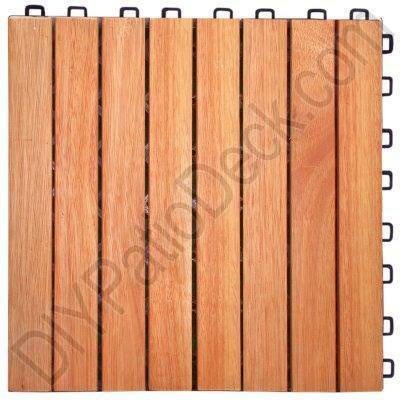 Additionally, it is approximately 10% to 20% more dense than Teak making it extremely durable. When it comes to ease of use, Eucalyptus tiles are especially helpful because they are more likely to saw clean if trimming is needed.